Sometimes kids can be so cute. All 5 of ours got onesies (onezies?) for Christmas and they love them. Home from school, out of the uniform, into the onesie aaaaaaand relax. Youngest got a tiger suit, complete with detachable tail (lost sometime around New Year’s day, so it did better than some of his presents). He LOVEs it! Puts it on whenever he has a chance. 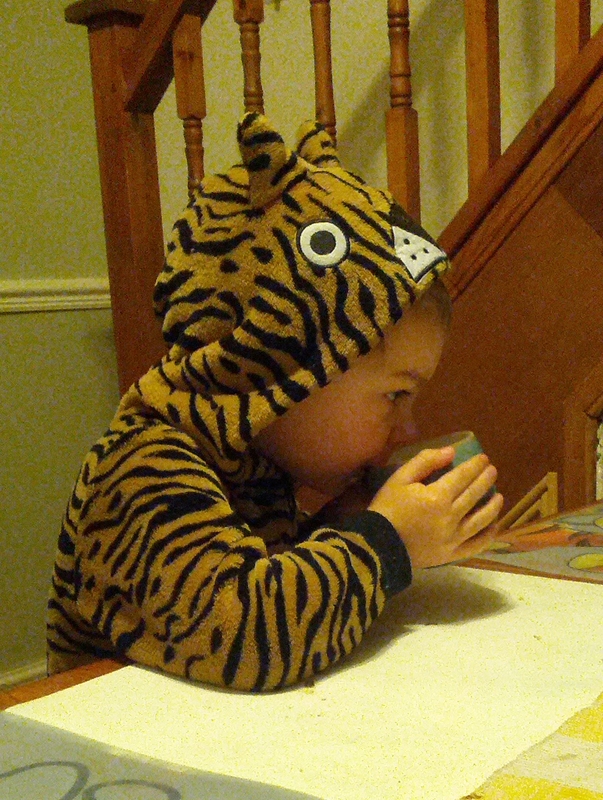 They must’ve done “The Tiger Who Came To Tea” as a story at nursery recently because, this morning, he was quite definitely the tiger who came to breakfast. He told us so himself. “And he ate all of the breakfast in the bowl and drank all of the tea in the mug!” he said, proudly, as he carried his now empty mug and bowl through to the kitchen. And if you haven’t read “The Tiger Who Came To Tea” to your kids, you must. If nothing else, “The Tiger ate everything!” is a cracking excuse to go out for fish and chips.